In 2017, nearly 1 in 10 firms in the wholesale and manufacturing sectors purchased goods abroad and sold them 'as-is' in foreign markets without the goods physically entering Canada. This activity—known as merchanting or direct trading—is not currently captured in traditional international merchandise trade statistics; therefore, it may be misclassified as domestic wholesaling activities in the Canadian system of macroeconomic accounts statistics. The information presented in this release is the result of a new initiative launched by Statistics Canada to better understand the involvement of Canadian firms in global production and distribution chain activities. The findings will also help the agency produce more robust estimates of international trade as measured in Canada's balance of international payments and gross domestic product. This first release analyzes the types of Canadian firms involved in merchanting activities. Subsequent releases will cover other aspects, such as goods for processing and global production and distribution. 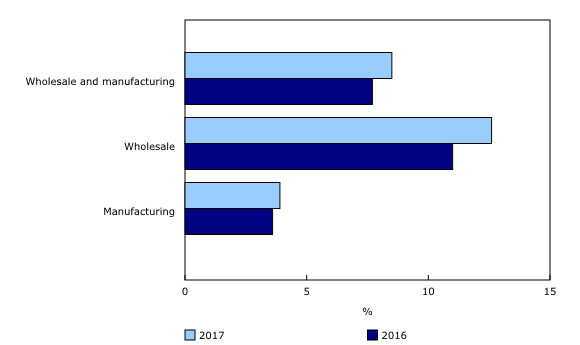 In 2017, 8.5% of Canadian wholesalers and manufacturers reported merchanting activities, compared with 7.7% in 2016. In both years, wholesalers were more active in merchanting than manufacturers. This reflects the fact that wholesale firms are primarily engaged in wholesaling merchandise, generally without making changes to the goods they sell. The wholesale sector had the largest proportion of direct traders at 12.6% in 2017, up from 11.0% in 2016. Wholesalers in the building materials and supplies industry (24.5%) accounted for the largest share of direct traders, followed by the machinery, equipment and supplies (20.9%) and the personal and household goods (16.9%) industries. In contrast, a much lower proportion of manufacturing firms (3.9%) engaged in merchanting activities in 2017. In 2017, most of the wholesaling and manufacturing firms (87.1%) engaged in merchanting were small firms with less than 50 employees. 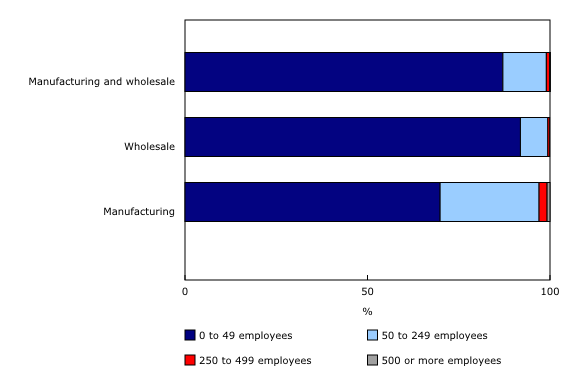 Larger firms, those with 250 employees or more, accounted for a much smaller proportion (1.1%). While small firms accounted for most merchanting activities in the wholesale sector, they played a somewhat smaller role in the manufacturing sector. More than one-quarter (27.1%) of all direct traders in the manufacturing sector were medium-sized firms with 50 to 249 employees. Among these firms, those in the machinery manufacturing industry accounted for the largest share of manufacturing direct traders. Three provinces accounted for 85.0% of direct traders in 2017: Ontario (47.6%), Quebec (21.3%) and British Columbia (16.1%). Building material industry wholesalers accounted for one-fifth of direct traders in Ontario and British Columbia, while wholesalers in the personal and household goods industry (19.0%) accounted for the largest share in Quebec. To obtain more detailed information on merchanting and other related global production and distribution activities, 300 firms were selected to participate in the 2017 Global Production, Supply and Distribution Survey. In 2017, firms that declared participating in direct trading generated $1.3 billion worth of sales from this activity, equivalent to an average of $28.3 million per firm. The profit margin resulting from merchanting—the difference between sales and the cost of purchases—averaged 13.3%. This ratio was comparable to the gross margin in the overall wholesale sector (16.5%) in 2017. In terms of destinations, Canadian firms reached a wide range of countries through their direct trading activity. The United States accounted for the largest share of sales (71.9%), followed by China (13.2%). Merchanting activities also reached other countries, including Algeria, Egypt, Morocco and India. The types of products sold varied across the different industries. The products most often traded through merchanting by Canadian businesses were metals (such as copper), steel, food, chemical compounds, tools, wood pulp and paperboard, and consumer products, including clothing, toys, cameras and furniture. In recent years, Statistics Canada launched an initiative to better understand the impact of Canadian firms involved in global production and distribution activities, and to improve international trade measures in Canada's balance of international payments and gross domestic product. The new information will also help the agency produce trade estimates in line with new international standards. As a first step, Statistics Canada included several profiling questions in the 2016 and 2017 Annual Survey of Manufacturing and Logging Industries (ASML) and Annual Wholesale Trade Survey (AWTS) to learn how Canadian businesses respond to the ever-changing business environment. The 2016 and 2017 ASML and AWTS are sample surveys intended to cover all establishments primarily engaged in manufacturing and wholesale activities in Canada. For additional methodology information and definitions, please consult the Annual Survey of Manufacturing and Logging Industries and Annual Wholesale Trade Survey webpages. As a second step, Statistics Canada launched the Global Production, Supply and Distribution Survey in 2017, a small-scale survey with a sample of 300 respondents. The aim of this survey was to gather more detailed information on the activities of Canadian firms in three areas of global activities: merchanting, goods for processing, and global production and distribution (for example, Canadian-owned goods made and sold directly abroad). In this release, the terms firms and businesses refer to establishments. Direct trading is used interchangeably with merchanting in this release. These terms are defined in the 2008 System of National Accounts manual as a "process whereby a unit in economy X, purchases a good from economy Y for sale in economy Z. The goods legally change ownership but do not physically enter the economy where the owner is resident." In the balance of payments, the suggested treatment is to record the purchase as a negative export (instead of an import) and the subsequent sale as a regular export. The impact of recording such activity would then be reflected in the trade in goods on the export side, as the margin between the purchase and sale values. Currently, Canada has not yet implemented such a measure. The initiative undertaken by Statistics Canada, which aims at enhancing international trade measures, will continue in the coming years. In 2019, the Global Production, Supply and Distribution Survey will be conducted again to collect information for the 2018 reference year. The profiling questions will also be included in the 2018 ASML and AWTS. Provisional estimates on merchanting activities for the full economy will be developed in the coming years with the ultimate objective of integrating these new estimates as part of Canada's official international trade statistics. The User Guide: Canadian System of Macroeconomic Accounts (Catalogue number13-606-G) is also available. This publication will be regularly updated to maintain its relevance. To enquire about the concepts, methods or data quality of this release, contact Angela Yuan-Wu (613-240-2871; angela.yuanwu@canada.ca), International Accounts and Trade Division.